Help kids learn when to capitalize words with these capitalization rules worksheets. These fun themed worksheets focus on capitalization and related concepts like punctuation. Children can practise editing paragraphs and writing their own. They'll be well on their way to becoming better writers! Review capitalization rules with your second grader by helping her correct the capitalization in a story about Kate and her pet skunk, Stinky. Kids practise capitalization by rewriting sentences. These dreidel rules will teach your child how to play the Hanukkah game. Use these dreidel rules, and the bonus paper dreidel, during the Festival of lights. These baseball rules for kids are a sneaky way to spice up study time. Help him learn the rules of the game with this quick refresher on quotation mark rules. First graders can gain capitalization practise by fixing the short paragraph. Simply change the appropriate letters to capitals then re-write the paragraph! Introduce your students to divisibility rules with this handy worksheet that goes over the rules and asks students to fill in examples. Can your first grader help Lisa proofread her letter by fixing the commas and correcting the capitalization? Your first graders should be well on their way to understanding that you can't write sentences without proper capitalization! 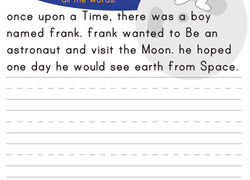 Bust out the red pen and encourage your first grader to fix the capitalization issues, and then re-write the space-themed passage. Use this resource with your students to practise spelling rules when adding suffixes to words. Students will correct five sentences and rewrite five more using their knowledge of commas, apostrophes, and capitalization. Practise identifying capital letters and learning the rules of capitalization by circling them in a letter.